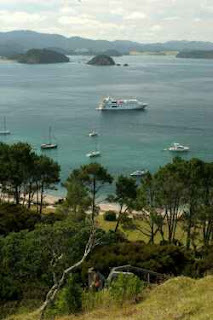 New Zealand’s idyllic Bay of Islands is one of the world’s most attractive aquatic playgrounds. How do I know? Well, I’m just back from five nights aboard Coral Princess Cruises’s Oceanic Discoverer where she has completed her short season in the Northland region of New Zealand. The narrow, labyrinth of waterways that stretch all the way from Auckland to Cape Reinga on the very tip of the North Island, are a stunning series of beautiful beaches, lush tropical islands and gorgeous bays and harbours. Attractive; because the entire region is populated by leisure and pleasure boats of all sizes. Oceanic Discoverer, at 2000 tonnes and with room for just 76 passengers, was probably the largest vessel in the region at the time. Other vessels included multi-million dollar sports cruisers, international luxury mega yachts and giant ocean racing yachts. There were even two classic sailing vessels, the youngest being perhaps 100 years old. Unlike her more rigorous expeditions in the Kimberley, PNG and Melanesia, this was a relaxed dawdle by comparison. All the same, she relished the crystal clear waters and tiny islands, many of which form valuable biological sanctuaries for New Zealand’s acutely endangered flora and fauna. Our program of shore excursions included nature walks, cruising aboard the 80-seat tender, Xplorer, and visits to wildlife sanctuaries like Tiritiri.